And a machine shop with fifteen auto mechanics kept the 100 trucks and cars of the flying squadrons in repair. Guards policed the headquarters and watchmen with tommy guns stood guard on the roof. Constant P A announcements and nightly mass meetings attended by thousands of strikers and supporters kept strikers in touch.5 A rank-and-file committee of 100 truckdrivers formed the official strike authority. The city polarized as the business forces, too, began to organize. Leading them was the Citizens' Alliance, one of the most powerful employers' associations in the country, with its own corps of undercover informers. It was dedicated to keeping unionism out of Minneapolis and for a generation it had been almost completely successful. Business leaders developed their own strike headquarters with barracks, hospital and commissary. As the conflict deepened they called for a "mass movement of citizens" to break the strike and began organizing a "citizen's army,"7 Many of whose members were deputized as special police.8 With an unusual clarity, two organized social classes stood face to face, poised for battle. The Monday battle was not decisive, however, and the reserves on both sides mobilized in the market again the next day. An extra 500 special police were sworn in, and according to Charles R. Walker's study of the strike, An American City, "Nearly every worker who could afford to be away from his job that day, and some who couldn't, planned to be on hand in the market. "11 Twenty to thirty thousand people showed up. No battle was planned; the melee began when a merchant started to move crates of tomatoes and a picket threw them through his store window. 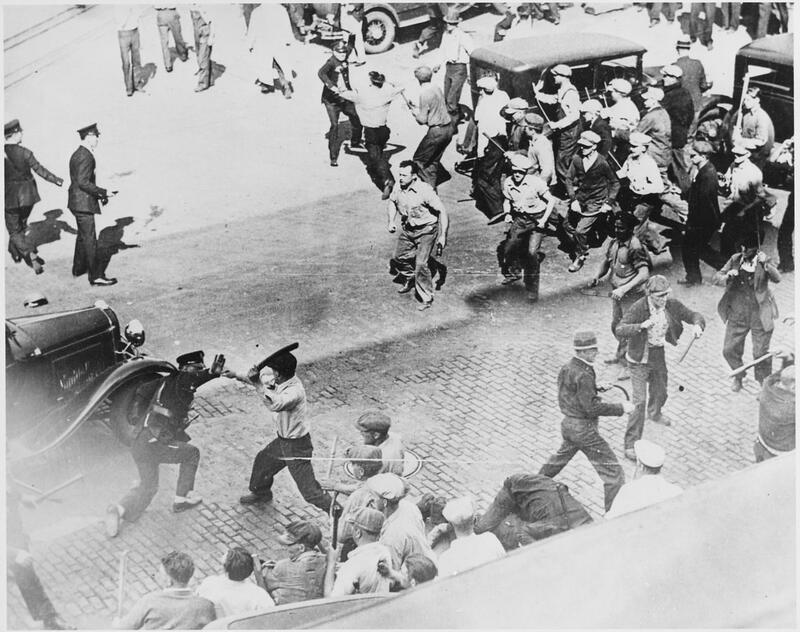 The pickets, armed with lead pipes and clubs, fought viciously with the police, driving them out of the market within an hour, then continuing to battle them all over the city. By nightfall there were no police to be seen in Minneapolis. Strikers were directing downtown traffic. 2. libcom note: "truckers" in this instance seems to be referring to the trucking companies as opposed to the workers themselves. 3. Charles R. Walker, American City, A Rank-and-File History (N.Y.: Farrar & Rinehart, 1937), pp. 97-8. 12. Cited Ibid., pp. 168-9. 13. Cited Ibid., pp. 171-2. "When the truckers refused to sign any agreement with the union, the Teamsters voted at a mass meeting May 12th to strike." Did Jeremy really mean to say that the union voted to strike after the truckers refused to sign an agreement with the union?" It was pointed out to me that "truckers" could mean the trucking companies. A fair point, but in modern parlance it's usually meant to refer to the drivers. So, a mistake in my reading of the article not in the original wording. It could have been stated more clearly, however.